A religious, Monty Python-esque point and click. 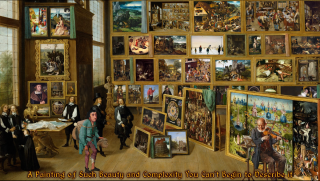 Four Last Things—an old-fashioned adventure game made out of stitched-together Renaissance art—is out now on Steam, which shouldn't come as too much of a surprise, seeing as I told you it was happening earlier this month. Following a successful Kickstarter, developer Joe Richardson has expanded his funny and rather beautiful point and click, buffing up the art and tweaking the writing—and, after playing it for a bit, I think it's definitely worth checking out. I've already come across some great jokes in my brief time playing it, but Four Last Things' main draw is its sublime artwork, Richardson having seamlessly glued together a load of public domain paintings in a way that looks remarkably cohesive. Period-sounding music helps with the atmosphere as well: nearly every scene is accompanied by a band of minstrels playing some old-fashioned tune. My only complaint so far is that the game doesn't appear to offer manual saving, while the autosave seems pretty infrequent—I'd lost a chunk of progress when I loaded up the game just now. If you're interested, Four Last Things is available on Steam here. There's a 10% discount until the second of March.